HELP! I HAVE A SLOW METABOLISM! 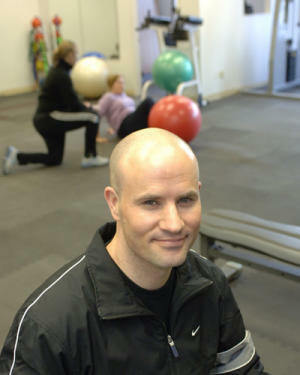 Brian Calkins is Cinncinnati's top Personal Trainer. In June of 2004 Brian was honored as one of the nation's top personal Trainers by the American Association of Personal Trainers. He is the author of many publications, and has his own radio show. These statements illustrate the confusion over the metabolism. My goal here is to help you understand what metabolism is and how you can begin to improve yours. Yes, I said improve yours! Most of the factors of metabolism are subject to forces that YOU control! When it comes to metabolism and the question of Nature vs. Nurture, the latter is the most predominant factor. 1. Muscle Tissue: The more muscle you have the more calories you burn regardless of how active you are, your age, etc. Lean muscle tissue is burning calories for you 24 hours a day – each and every day, even while you’re watching TV, blinking your eyes and sleeping! 2. Meal Frequency: Frequent eating while matching energy expenditure allows metabolism to elevate. In contrast, going too long between meals causes a significant slow down in metabolism. 3. Activity Level: Obviously, the more active you are the faster rate you’ll expend calories and allow for a heightened metabolic process. 4. Food Choices: Eating quality complex carbohydrates from whole grain sources, leaner proteins and fresh fibrous carbs allows the body to become more thermic in nature, elevating both metabolism and caloric burn. Conversely, high sugary foods (including many of the “fat-free” foods), saturated & hydrogenated fats and bleached, processed & refined carbs have little impact on stoking metabolism. In fact, many of these foods are considered “empty” in caloric value. 5. Hydration Level: Low water intake can lead to poor organ function and additional stress on the body, which contributes to a slowing of metabolism. 6. Stress: Many times when we’re under stress, we eat! And we eat the wrong foods! Also, high stress causes elevations in the hormone Cortisol, which interferes with the body’s ability to lose excess fat, lowering metabolic function. 7. Genetics: Yes it’s true that some people are born with better metabolisms, but there is nothing that you can do about that. Of the 8 factors of metabolism, only 1 is outside of your control! I’ve seen many people who claimed they had a slow metabolism lose excess weight at a rate they perceived to be incredible. Was it? No, they just applied the same information you’re reading right now and were very pleased with their results. 8. Hormonal Production: Before you run out to see an endocrinologist to determine if your hormones are out of balance or your production of T3 and T4 are compromised, initiate a well designed program of exercise and supportive eating to optimize metabolic function. Most people just need to make the aforementioned adjustments and they’re on track for cranking up their slow metabolism. If in fact you see little change after several months of incorporating these changes, then a visit to your endocrinologist can help you to adjust the estrogen / progesterone balance as well as to compensate synthetically for any thyroid deficiencies. In summary, eat small meals by frequently combining lean proteins with small servings of natural complex carbs, avoid simple sugars and bleached flours, exercise both aerobically and with resistance, and check hormonal levels with an endocrinologist only after you’ve made lifestyle changes. The Complete Fitness Transformation program has proven to be of great value to those with metabolism concerns who came to me in desperate search of fat loss. With the proper technology in place, and with some patience and commitment, slow metabolisms can be a thing of the past, allowing you to re-shape your body in very desirable ways.